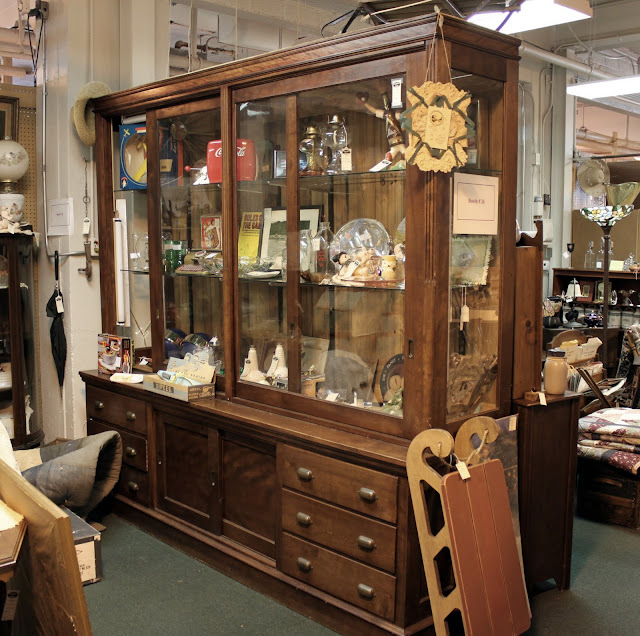 Vintage Home & Garden: did I...or didn't I...buy that big ol' cabinet??? Well girls...I have made a decision. In terms of what I want to pay for my wood furniture pieces, that is. I wanted it soooo badly when I first laid eyes on it. Tall, dark and handsome...it was just what I have been waiting for my whole life. The sliding glass doors...the original metal pulls...I had.to.have.it. So I talked to the owner of this lovely cabinet. I told him how I ran up and hugged it the moment I saw it. He either thought I was totally crazy...or was really crazy in love with it. I told him about how I wanted to fill it with my white ironstone collection. He said "no way could you have enough ironstone to fill an 8ft x 8ft cabinet!" And I replied "uuuhhhh....yeah, I actually do." From over my shoulder my always silent husband says "Yes, trust me...she does." Thank you, baby for helping me make my point! I love how when I want something, he always wants it to. Even though he could not care less about all these white dishes or a big old cabinet to put them in. Love that guy. I wanted him to see...I need this cabinet...and this cabinet needs me. He told me there were originally 3 cabinets like this, and they came from a room of an old Opera House. He had already sold the other two for $1,500, and that was a deal. Yikes. The $850 was way more than I was wanting to pay, so when I heard the other two went for $1500...I knew I didn't stand a chance at talking him down. But, when I want something...I cannot be stopped. I will make it happen. No is not a word in this girl's vocabulary. So I went home and "slept" on it. So I talked to him again...I used a few tricks that usually get me the deal I want...and I think just to get rid of me...he sold it to me for one heck of a sweet deal! He knocked $200 bucks off...and this baby is officially mine! I pick her up Saturday...then the transformation begins. Now, lets hope she turns out as fabulous as this one...I just happen to have chairs similar to these...and I am on the hunt for a farm table like this one. Isn't it a tragedy there is no chandelier hanging above the table? That light is just wrong! Wish me luck on getting her home! I will be sure to show you pictures when I get her done! If I can figure out what all those buttons mean on my new camera. I can never get good shots inside my house!? Anyone that knows, feel free to come on over and show me how! I will come take them!! I can't wait to see her when she is finished~ Bravo on getting the price you wanted and making her yours! Oh Mary....I'm so excited for you...I know your gonna make that big girl look stunning. How exciting!!! You are so right about that pic, no chandelier? It just looks naked, what were they thinking? Congrats on the great deal, it will be amazing, I'm sure. That is good news. For you and us blog readers who are dying to see your transformation of such a gorgeous piece. I am not a good photographer, but have better success with no flash. Natural light seems to make the room look better and the flash brightens things too much and casts too much yellow. I agree... tragedy no loveliness is above that table! I am so happy you got the cabinet and for a deal!!! I showed it to my hubs the other day and we were both drooling!! I get obsessed like that too! You should have seen me work when I found the fridge I had to have at an outlet. I would not stop. LOL. I love that cabinet and Im so happy you got it! YOU GO GIRL!! I was so hoping he would knock some money off for you and I can totally see it now, how gorgeous that cabinet is going to look....stunning, makes me want one! And you better show photos....turn camera on manual, turn ISO to 1600, pull your F stop way down low (3.5 or lower) so the aperature (opening) on your camera is wide open for more light...and play with your shutter speed, usually a round dial you can move back and forth...faster shutter speed means the amount of time your shutter/lens will be open...play around with your shutter speed...low light means longer shutter speed! go here for more: http://digital-photography-school.com/moving-toward-manual-settings-understanding-aperture-a-beginners-guide- ok, now you have no excuses! wow, your bargaining skills and sticktoitivness are quite impressive. i can't wait to see the makeover! Just gettin' back to you about my basement...yep....I live in a 1890 farmhouse...that was moved here from another location...so lucky me...I get a sun-filled basement...that gets lots and lots of use. Just found your blog through Sixty-Fifth Avenue. Love the cabinet that you bought! Wish I had the room for something like that in my house and I wish I had enough ironstone to fill it. Can't wait to see your transformation!! Congratulations on your new "baby" Mary. I do think that the right piece of furniture finds you and this one sure did. I really love it too! That is one spectacular piece. Looking forward to seeing the end result. What a great piece of furniture. So happy you got to bring her home with you. woohoo! So awesome...I can;t wait to see it painted up. 2 more weeks until Kane...So much to do. Yay!! I couldn't wait to see if you were going to buy it. I don't think you'll regret it and that is a really REALLY good deal! I didn't even think the original price was bad at all. Congrats - I'm looking forward to following what you do with this incredible piece. Hope it turns out beautifully! I got the metal numbers at Watson Kennedy in Seattle. you are going to make it so beautiful! Beautiful and what a good feeling to get a bargain!!!! I have a big one in my house,not as big as yours, but it was at a garage sale for a $750!!!! It's a Martha Stewart and retails for $2300, but it was still way too much for me!!! I gave her my #, said I could spend $500 if it didn't sell and she still wanted to get rid of it...the rest is history!!!! I love it!!!! Music to my ears! Nice work, my friend...I'm so happy for you and can't wait to see it filled with your ironstone collection! I can't wait to see the pictures. You got a great buy! It's beautiful and once it's full of ironstone....I am so totally jealous;) Love it!!! I can't wait to see what it will look like painted a dreamy white and full of creamy ironstone. I'm so happy you found a way to make it yours. THAT IS ONE AWESOME PIECE OF FURNITURE! I CAN SEE WHY IT WAS A MUST HAVE! GOOD FOR YOU! Yes, you H A D to come home with that beautiful hutch... oh my goodness it's just fabulous and how you want to transform it... my heart pitter patters!!! Followed your link from Reinvented. Great blog! Looks like you're about to have a whole buncha fun! Can't wait to see it done. Those love letters are wonderful. Great posting. Good bargaining! I knew you could get a deal!!! 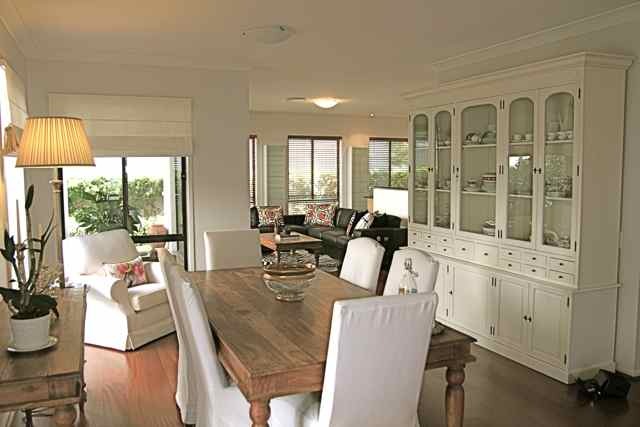 OOOOH:) If you paint your new cabinet like the one in this picture it will be just dreamy!!! LOVE it. I'm gonna have to hang around to see the after pics of this one:) LOL! Can't wait. It was meant to be yours, absolutely! Wish i could make photo's of it but to far away! There's nothing like a great deal on something you really want. It will be beautiful filled with ironstone. Good for you.